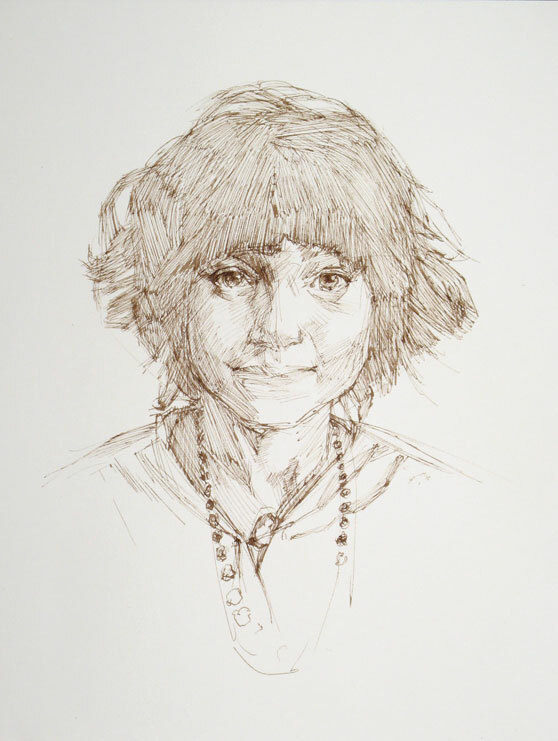 Here is a drawing made with homemade walnut ink – 9X12 on Arches hot press watercolor paper, cropped a bit. Once again a Steve McCurry photo provided the reference. I sketch in ink pretty regularly, as a way to practice and keep my hand in on an everyday basis, but normally I sketch with a ballpoint pen if I’m out and about. (My bosses know that sketching is the best way to keep myself awake and focused during a meeting!) When I’m at home, I like to use crow quill or brush, and a bottle of ink, preferably one of the inks I’ve made. Walnut is a favorite of mine. I love ink drawings, but I don’t care for how tight mine normally are – I tried to force myself to loosen up with this one, with some success. Instead of drawing flat on a table, I put the watercolor pad on an easel and leaned it back, and held the pen as I would a paintbrush. I think it will be a good method for me, and I’m happy with how it came out. Ink drawing without making a pencil sketch first also helps. Anyway, if you go the same route I did, making walnut ink is about as easy as it could be. 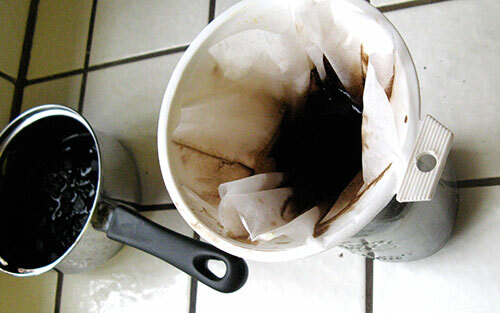 Simply cover the dried husks with distilled water and simmer them for an hour or three until you’ve got a nice thick dark liquid, adding more distilled water if necessary, then drain through a coffee filter as with the iris green. You’ve got a pretty ink! If you keep it for a while it will mold, and then you just filter it again. I add a bit of clove oil to mine as a natural preservative, it helps a bit. I understand that another ink can be made with pecan shells, and so of course I’ve got to try that as well. Incidentally, regarding the two previous posts: I have resurrected an old mystery surrounding iris ink. According to numerous medieval sources, it is possible to obtain a blue color from iris by “leaving out the yellow parts.” Thompson and others assumed that the “yellow parts” meant the pollen, but were confused that following the instructions doesn’t seem to work at all. I myself thought at one point that it may have been a bit of a medieval joke, based on green normally being derived as a mixture of blue and yellow. However, through experimentation I’ve discovered that the iris juice, or at least the juice from my more violet blue irises, will indeed paint blue, if one adds only a very small amount of alum. Perhaps that is what was meant? I don’t know why alum would be referred to as “yellow parts,” but then I’m not privy to the various inner meanings in medieval alchemy, puns, or insider codes. Anyway, it might be a possibility. Other medieval inks I’ve made besides walnut and iris green: brazilwood red, buckthorn yellow, saffron, folium red and turnsole blue (the color from which Sunsikell derives its name). All beautiful colors, which I’ll show and discuss in later posts. Medieval inks I have yet to make: iron gall, poppy and cornflower. The fun never stops around here! For this amount of iris petals – a heaping dinner plate full – I used about a tablespoon of alum. (As it turns out, that was a bit too much. I’m still learning.) 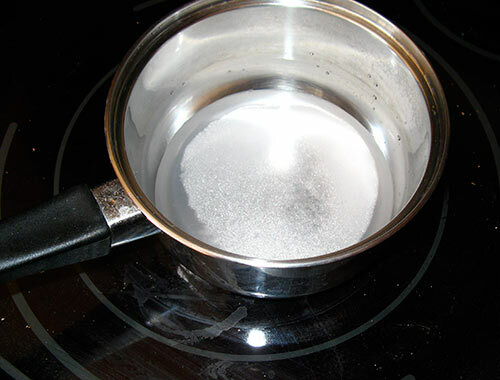 Put it into a small saucepan and cover it with distilled water, about a quarter inch deep. The alum should dissolve within a few minutes. If it doesn’t, then you may need to add a bit more water – but when used in an ink, it’s generally better to start with too little water rather than too much, to avoid diluting the color too much. You can always thin the cocktail later if the color demands it (this often happens with buckthorn yellow, which is really strong). If you’re making a lake pigment it doesn’t matter. Once you’ve got your alum dissolved, go ahead and add just a bit of it to the iris dye. Swirl the jar around, and If you’ve put in enough of the alum, you should see the color change from purple to a cool blue (if it doesn’t do this, try adding a bit more of the alum). The picture on the right shows the difference – compare this with the violet color of the liquid in the previous post. Transparent colors can often shift hues in more concentrated amounts like this, and this is a very transparent color. 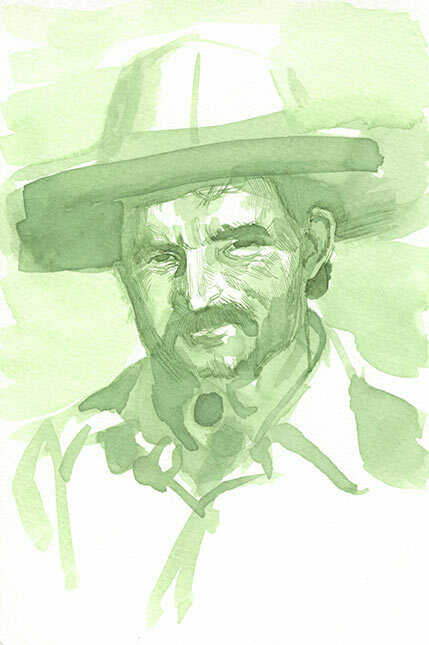 It will be green when you brush it onto watercolor paper. I like to use wine as a binder for inks if I mean them to keep, as recommended by Theophilus in his Essay Upon Divers Arts; the sugars in the wine bind the ink to the paper, while the alcohol gives a bit of preservative function. (If I’m going to use the ink right away, then glair makes for a wonderful binder instead.) The wine I have used so far is an ordinary cooking wine that contains a salt and some kind of preservative in addition to the wine. You can cook the iris petals directly in wine instead of the distilled water if you want to; this may affect the resulting hue. If your green turns out too delicate, you can steep it on the stove some more to evaporate off some of the water, or simply leave it in an open container for a while. This was done with sap green and iris green, and is called inspissation (thickening by heating or evaporation – and there’s your new geek word for the day). Here’s where my adding too much alum became apparent: as I inspissated the liquid, the oversaturated alum began crystallizing out. Well, I learned what an alum crystal looks like! Iris green will also make a lake pigment, but I’m not convinced it’s completely insoluble. The iris juice – especially without the wine – will spoil eventually. It’s not a bad idea to keep whatever you don’t use right away in the refrigerator. 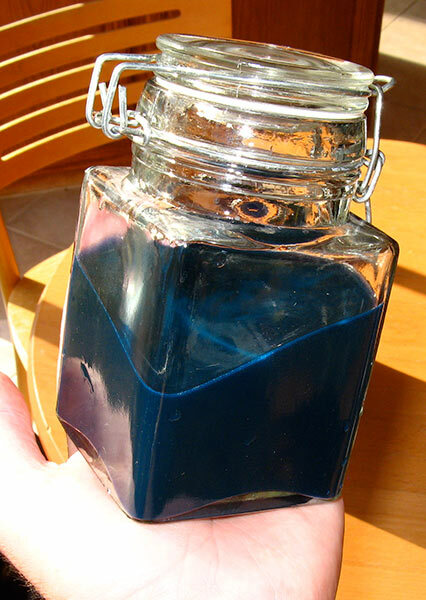 So, if you’ve got some irises in the garden, you can make a nice bright green ink easily with a little alum and/or cooking wine. To the right is a little sketch done in this color, once again from a Steve McCurry photo; not a very good likeness, but you can see what the color looks like. Post any questions if you’ve got ’em! You are currently browsing the Sunsikell blog archives for July, 2010.